A North Carolina quit claim deed form is used to transfer the ownership of property between two or more people. North Carolina quit claim deeds are typically used by parties that know each other and want to transfer property fast with no hassle. North Carolina quit claim deeds are prepared by a GRANTOR – the person or party transferring the property – and signed over to a GRANTEE – the person or party receiving the property. Quit claim deeds are often used by relatives during a divorce or a death in the family. Once the North Carolina quit claim deed form is recorded at the county clerk’s office, the GRANTOR will have “quit” any interest he or she has in the property and the property is then transferred over to the GRANTEE. A North Carolina quit claim deed form is commonly used to quickly transfer property without hiring a lawyer. Benefits of using a quit claim deed for North Carolina include transferring property between family members, taking a former spouse’s name off of the title during divorce proceedings, assigning property to a trust and clearing any kind of residual interest in a property. 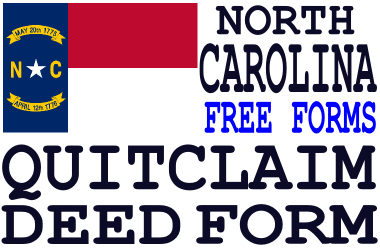 Fill out and print a free North Carolina quit claim deed form online in just minutes. Use a warranty deed form in North Carolina to transfer ownership of property between a buyer and seller – especially if you need a guarantee. North Carolina warranty deeds guarantee that the seller owns title to the property and it’s clear of all claims that might arise later. A North Carolina quit claim deed form is also used during the transfer of property. However, there is no guarantee that the title to the property is clear of all claims. A North Carolina quit claim deed, in essence, allows the owner of the property to quit ownership and convey that interest to another. A North Carolina quit claim deed form is a popular legal form for family members to gift property. You should use a quit claim deed in North Carolina for fast transfer of property. You should use a North Carolina warranty deed form when you buy property to guarantee that there are no liens or claims to the title. Preparing a North Carolina quit claim deed is fast and surprisingly easy. First, date the form and fill in the GRANTOR and GRANTEE names and addresses. Next, enter the address and a full description of the property to be transferred. Make sure to include a complete description here! 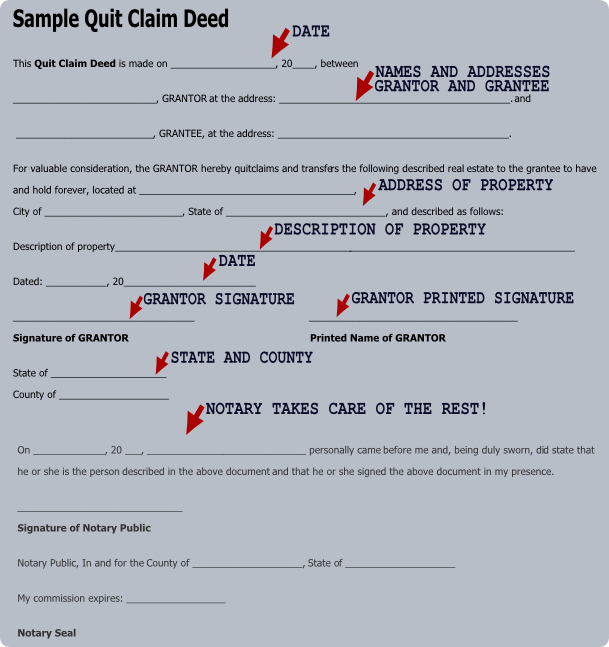 Should a North Carolina Quit Claim Deed Form be Notarized? To make your quit claim deed valid in North Carolina it must be signed and sealed by a notary public. Anyone with a notary public license can take care of this for you. You will also need two witnesses when signing. A quit claim deed form in North Carolina becomes a binding contract once it is signed, witnessed and notarized. And, once the quit claim deed is recorded at your local county clerk’s office in your local courthouse it then becomes a valid transfer document. Do I Need a Lawyer to File a North Carolina Quit Claim Deed Form? You don’t have to use an attorney to prepare a quit claim deed in North Carolina. A North Carolina quit claim deed form is very simple to complete on your own – you can do it yourself and save money. However, there is no substitute for good legal advice. We strongly suggest that you consult an attorney if you have any questions about filling out a quit claim deed in North Carolina. You should use a do it yourself quit claim deed form only if you know what you are doing! To file a quit claim deed in North Carolina, take the deed to the local courthouse and go to the county clerk’s office. It could also be called the county recorder or deed registry office – it’s wherever the land records are kept in your county. For a small fee, the county clerk will make a copy of your North Carolina quit claim deed form and sign, stamp and date the two deed forms. The clerk will then give the original back to you and file the copy in the local land records to record the deed. Fill out and print a free North Carolina quit claim deed form in just minutes online.